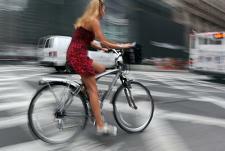 Car drivers and bicyclists often have an uneasy relationship. Drivers sometimes see cyclists as nuisances, while cyclists have to treat cars as potential threats to their safety. To help us all share the road safely, here are seven golden rules for getting along with bicyclists when you’re driving. Understand the risk. In a car, you have tons of steel and safety features surrounding and protecting you. A bicyclist is protected by nothing more than spandex and a helmet. It wouldn’t take much for your car to cause serious injury or death to a cyclist, which means you need to be extra cautious. Treat them as cars. Legally, bicycles are vehicles. They are supposed to be on the road with you and have to follow the same traffic laws. Respect them as you would respect any other vehicle. Give them space. A bicycle might not take up much room on the road, but that does not mean you should try to share a lane with it. And before you tailgate, remember that a cyclist can stop very quickly. Don’t turn right into a cyclist. Especially when there is a designated bike lane, make sure there isn’t a cyclist approaching to your right before you turn right — and right into him. Don’t turn left in front of a cyclist. You know to yield for approaching traffic when you’re making a left turn. Make sure you also scan for approaching bicyclists, and don’t underestimate how fast they are approaching. Don’t “door” them. Even when parked, you need to be concerned about getting along with bicyclists. Look before opening your door, or you may end up hitting an unsuspecting cyclist with your car door. Appreciate the benefits. Don’t look at cyclists as a nuisance. Instead, appreciate them for who they are and what they are doing: commuting without crowding the road, adding to air pollution or driving up demand for (and the price of) fuel. For more helpful tools or tips for getting along with bicyclists when you’re driving, contact us at Swapalease. We can also get you into a car that meets your needs and suits your lifestyle. We’re always happy to help you with your driving needs. This entry was posted in Driving Tips and tagged assured clear distance, bicyclists, car safety, sharing the highways, smart driving practices by admin. Bookmark the permalink.